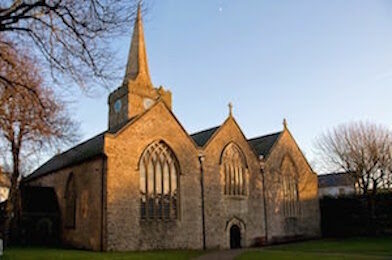 Welcome to the website for St Mary&apos;s Church in Tenby! St Mary’s Church Tenby leads the Rectorial Benefice of Tenby - a team of five churches who strive to serve our local people and also the many thousands who visit us each year. We belong to the Diocese of St Davids in the Church in Wales and we hope people of all backgrounds and traditions will find a warm welcome here. We recently joined up with the churches of St Julian's and St Annes to form The Tenby Group of Churches. We try to provide a variety of services in styles to suit different tastes, from the formal and traditional through to more modern and youth-orientated worship – always acknowledging our Anglican heritage. We have a strong commitment to children and young people, to pastoral care, to lay ministry and to our strong musical tradition. Above all we believe that Church life should be enjoyable and exciting, that the Church is a great celebration of God’s love, a celebration into which everyone is invited through Christ’s death and resurrection. Come and join us! The majority of the remaining building dates from the 15th century with some features retained from the 13th century. There is believed to have been a church on the site since Norman times, and Gerald of Wales is counted as the earliest Rector of Tenby. The 13th Century chancel has a 'wagon' roof and the panelled ceiling has 75 bosses carved in a variety of designs including foliage, grotesques, fishes, a mermaid, and a green man, as well as the figure of Jesus surrounded by the four Apostles. St. Thomas' Chapel was added in the mid-15th Century, and the St. Nicholas Chapel was added c. 1485. The spire is also a 15th-century addition. Inside the church is a 15th-century font and a 15th-century bell, cast with the letters 'Sancta Anna'. The tower is positioned to one side of the chancel and dates from the late 13th century. The first floor served as a chapel, and still has a stone altar and piscina in place. 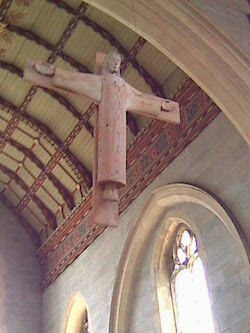 The church has two fonts, one dating from the 15th century and another late Gothic example from the 19th century. The church contains several memorials, including the tombs of Thomas and John White, both Mayors of Tenby in the fifteenth century. Thomas White was famous for hiding a young Henry Tudor from King Richard III. There is also a wall tablet in memory of Robert Recorde, an Elizabethan scholar, who introduced the equals sign ( = ) to mathematical calculation. The church was Grade I listed in 1951, being of exceptional architectural and historical interest. In the churchyard, 20 metres west of the church, are the remains of what is believed to be a late 15th-century choir school or college. The wall includes a pointed arched doorway. These remains are Grade II* listed. 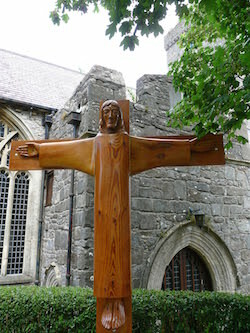 The figure of Christus Rex was given to St Alban’s Church, Llanelli, by Canon D.T. Davies. 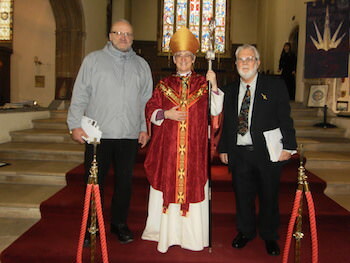 “Canon DT”, as he was affectionately known, had retired to Llanelli from his last parish in Holyhead, and he commissioned the Christus Rex when his wife Lena died in 1972 and presented it to St Alban’s Church in her loving memory. The Sculptor of this fine piece was Jonah Jones, 1919-2004, who, although originally from Co. Durham (now Tyne and Wear) and attended school in Jarrow, spent most of his working life in Wales and became known as “The Welsh Sculptor”. In 2004 Jones he was awarded posthumously the Honorary Membership of the Royal Society of Architects, Wales. His other works include Madonna & Child in Ampleforth Abbey in North Yorkshire, a stained glass window in Ratcliffe College Chapel, Leicestershire, and other works in St Patrick’s Catholic Church, Newport; the National Museum, Cardiff; Coleg Harlech, Gwynedd; and Mold Crown Court, Flintshire. We have been approached by a number of people suggesting they would like to be able to hear or read our sermons after the services we have. Therefore, we now have the new section to our website: 'Sermons' where these can be accessed when they are added. Also, during Lent this year we are having our Wednesday evening talks and Compline on 'The Lord's Prayer.' Joel started us off last week, looking at the wonderful first line of the prayer, 'Our Father who art in Heaven.' This sermon audio is now available on the 'Sermons' section if you would like to hear it. Every week's Lenten talk will be added if this is agreeable with the preacher. Please do come to the services through Lent on a Wednesday evening at 7pm. All are most welcome! Why not head over to the 'Sermons' section now to hear Joel's talk on 'Our Father' and enjoy the great privilege that being a child of God truly means. Sunday, 6 th January saw the five churches of our benefice meeting together for the final time, as we prepare for the benefice to be dissolved on 19 th March. 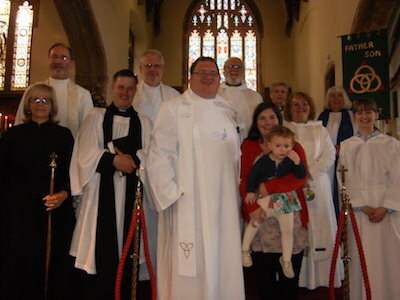 Farewells were said to Penally and Gumfreston churches and also to Reverend Robb Wainwright, who now takes them with him into a new pastoral grouping with Manorbier, St. Florence and East Williamston churches. This is not a complete ending, of course, because we will all be part of the wider new Local Ministry Area of Narberth-Tenby, which will be made up of twenty churches, from Amroth in the east, to Roberston Wathen heading north, Lawrenny to the west and Manorbier in the south. However, this is the end of the Rectorial Benefice of Tenby, formed in 1985. We used Sunday’s service as an opportunity to offer to God our renewed commitment to Him and to our new future arrangements here. We further asked for God’s blessing on us all, and especially to thank Robb and his wife, Lindy, as new challenges await them in the coming years. After the Service of Holy Eucharist our Rector, Canon Andrew Grace, spoke in his usual heart warming yet amusing style to publically express the gratitude of himself, the wider clergy team and the entire church family for all Robb has contributed as Team Vicar over the past six years. Rector’s Warden, Nicole Evans, enthusiastically added to the sentiments already expressed and presented a gift to Robb and flowers to Lindy. 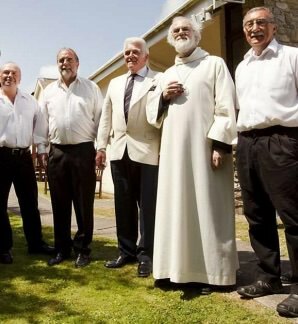 A sincerely warm response from Robb was very well received, while parishioners enjoyed delicious canapés and wine, served by the now almost world famous team of caterers, The Soupermen. 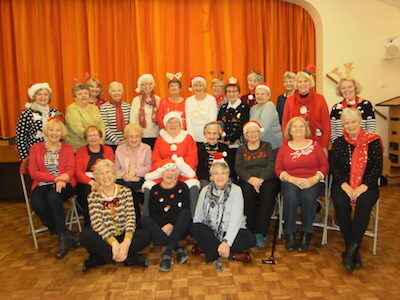 At the Christmas meeting of St. Mary’s Mothers’ Union members were very pleased to welcome Tenby Townswomen’s Guild Singers, under the gifted baton of Judy Davies. We celebrated the season of Advent through music and song, poetry and prose, mince pies and tea! The delightfully varied programme had been skilfully planned by Nicole, who was at pains to point out that she had been perfectly tutored through the years by our own literary expert, Joy! 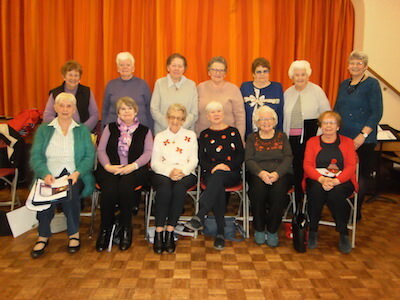 The Townswomen’s Guild Singers gave us two performances of some wonderfully modern and jazzy carols, along with some more traditional yet charming pieces. 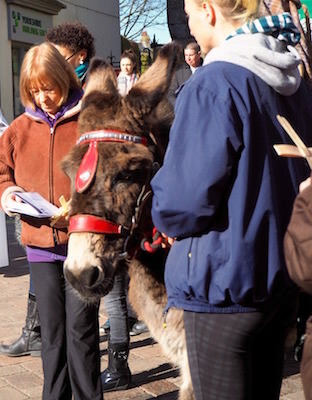 We were even given the chance to join in when we were taught the refrain to a wonderful carol about all of God’s creatures singing in harmony. The accompanist was our own talented pianist, Margaret. At the beginning of the meeting we had great cause to celebrate as we congratulated two special ladies on remarkably long membership of Mothers’ Union here in Tenby. Mrs Mair Marquiss first joined in 1958 and Mrs Joy Griffiths in 1968, so sixty and fifty years of membership respectively! 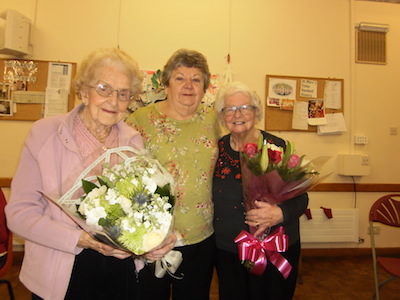 Both ladies were presented with beautiful bouquets and cards by another long time MU member, Thelma Waugh. Tenby MU, supported by Penally MU, will be hosting the MU Festival of Light for the diocese in St. Mary’s Church on Saturday, 12th January 2019, in a service of readings and carols, led by our Rector, Canon Andrew Grace. This promises to be an uplifting and memorable event, enriched by choral contributions from St. Mary’s Choir. Before the afternoon came to a close delicious seasonal refreshments were served by Anne and her busy elves. We thank them all for their hard work and all members who generously provided mince pies. We look forward to our first meeting of 2019, on Tuesday, 15th January at 2pm, when we will attend church for Holy Eucharist. With the new year we are all hoping to welcome back our leader, Ellen, and want to wish her in particular, along with all members, their families and the wider St. Mary’s Church family a truly happy and healthy coming year. “God has called you by name and made you His own”. These inspirational words express the sense, truth and significance of Sunday’s Confirmation celebration, held on the first Sunday of Advent Benefice service at St. Mary’s Church. 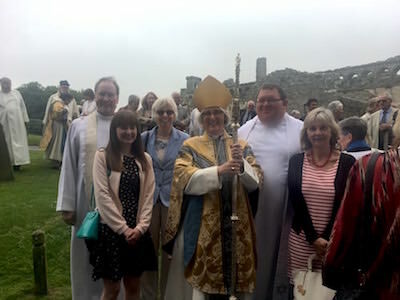 Two adult candidates were in attendance to receive confirmation of their decision to formally enter membership of the church and were presented to The Bishop of St. Davids, The Right Reverend Joanna Penberthy during the Holy Eucharist. 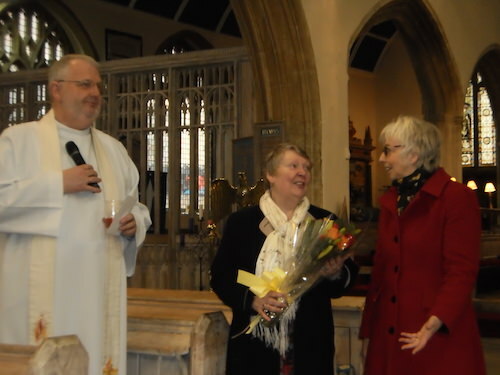 The Bishop was accompanied and assisted by her Chaplain, Reverend Caroline Mansell. The candidates this year were Ian Thomas Wilson Kirkby and Gerald Nicholas Hewitt. 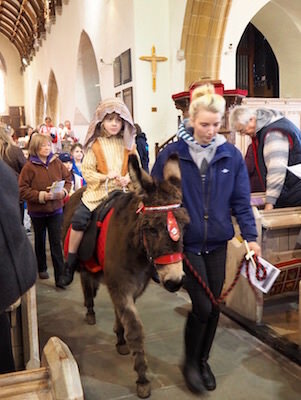 This was a truly joyous and uplifting event for Advent Sunday, at which time we prepare for the wonders of the birth of Jesus, a king born in a humble stable over two thousand years ago. At the beginning of the service our Bishop lit the first Advent candle and clarified the relevance of each of the candles. Bishop Joanna spoke with great passion about the significance of Confirmation and, basing her words on the scripture readings referring to judgment, she shared her belief that it is not to be feared, but to be relished. She expressed her certainty, particularly to the candidates, about the significance and relevance of God’s Holy Spirit being freely given to us all in our individual lives. The inspiring music for the service was arranged by Director of Music, Dr. John Harrison and Choir Master, Mark Thompson. The entire service was enhanced by favourite Advent hymns and the splendid renditions offered by the choir, particularly the Introit, Arwain fi. 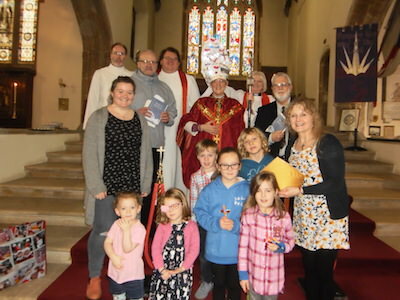 Members of Sunday Club joined the congregation near the end of the service and presented Bishop Joanna with a unique and magnificent mitre, complete with lights and wonderful decorations! She promised to wear it (some of the time!) at the services she will be conducting on Christmas Day! 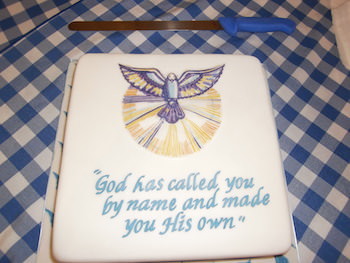 Following the service a special celebratory cake, made and decorated with her customary creative skill by Lindy Waimwright, was served to the candidates, their friends and families and benefice members, bringing to a close a most enjoyable and important occasion. Details of all events and services throughout Advent may be viewed on the notice board outside church and can also be found on the weekly pew leaflet and the church website. 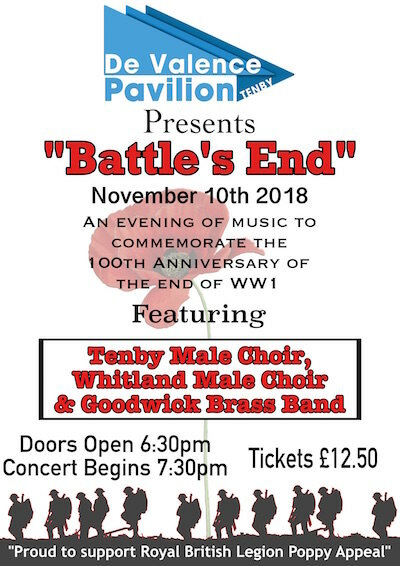 Enjoy an evening of music to commemorate the 100th Anniversary of the end of World War One. 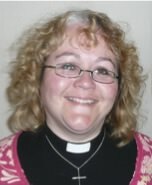 “The Bishop of St Davids is delighted to announce the appointment of the Revd Alex Grace to be Priest-in-Charge of Pembroke Dock and LMA Vicar Designate of the South West Pembrokeshire Local Ministry Area upon its inauguration in 2019. Alex is currently the Priest-in-Charge of St Florence and Manorbier. Alex will be licensed in Pembroke Dock by the Bishop at a date to be announced. The Bible Course - Come and Join Us! You may well remember last year we ran the Bible Course. It was very much a success. It is a course that in 8 weeks takes us throughout the Bible, starting in Genesis and ending in Revelation. The course, written and presented wonderfully on DVD, by Revd Andy Ollerton, helps all of us, no matter our background and confidence with the BIble, to start to learn how to read it for ourselves and study it with confidence. Ever wondered why Leviticus is important and need not be scary? Or perhaps why certain books are included in the Bible? These questions, and so many others, are answered in the course. Kathy and Henry Johnston came last year, and they reflected that, “We never have the chance at our services to ask questions or to dig deeper into the Scripture, so if we want to learn more then we have to rely on individual Bible study. 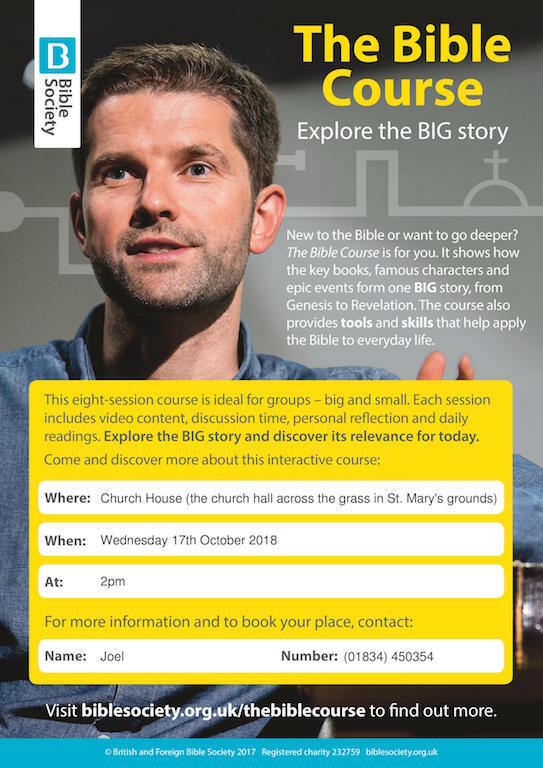 The Bible Course is a really great opportunity to learn more about the Bible with fellow Christians, to listen to individuals own take on a particular passage, and to hear what their faith means to them. This course is designed to provide a good overview of the Bible, and for those of us who lead busy lives, it is a chance once a week to put the Bible in the forefront of our lives with others who seek to learn more. It is also an opportunity to ask questions without feeling silly or embarrassed, and we do laugh a lot!” Revd Ollerton helps us start that process of studying the Scriptures together, realising that the Bible in its entirely is both essential to us, but also, actually, entirely possible for us to study, and enjoy studying, as individuals and in groups. All are thoroughly encouraged to come. The course has been marvellously updated and renewed, so that means all those who came last year should come again too. This is the website, please do take a look, https://www.biblesociety.org.uk/explore-the-bible/the-bible-course/. 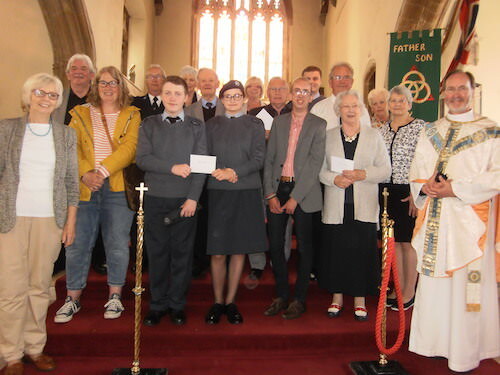 At the Benefice Holy Eucharist last Sunday, 2 nd September, donations were made to the local representatives of three very worthy charities, as a result of the highly successful twentieth Memorial Posy Festival, held over four days earlier in the summer. Kathryn Harries, representing Diabetes UK, Amanda Daniels, Assistant Director of SNAP Cymru and Cindy Jenkins, Leader of Snap Pembrokeshire at Withybush Hospital all attended the service and were presented with generous cheques by three members of the Posy Festival Committee. Presentations to each charity were made by Mrs Mary Smith, Mrs Judith Williams and Miss Maureen Webb. All three recipients expressed their delight and gratitude at being nominated to be beneficiaries of such substantial gifts and spoke briefly to explain the roles of their various organisations. Rector Andrew Grace then offered prayers for the magnificent work of these charities and for those who benefit from their support. In order to generate these funds over two hundred and fifty yellow and white posies, along with window displays and individual arrangements adorned St. Mary’s Church over four days and we welcomed visitors from far and wide to enjoy the floral spectacle. and Rector, Andrew Grace. Judith Williams is missing from the photograph. In 2008, as Harvest Thanksgiving approached, I had the idea to call together a group of men to put on a Harvest Supper at St Mary’s. I advertised for men in the Pew Leaflet, fixed a date for a meeting, and waited. I was delighted that about a dozen enthusiastic men turned up for the meeting, and the ensuing Harvest Supper was a great success, the men feeding nearly 100 guests with a three-course meal. But once Harvest was over we realised that we had something special here - we had hit on a rich seam of talent and enthusiasm, and there was immediately a sense of belonging. In church life we tend to have more practical happenings for women, but here was a group of men who had found a niche and a role with exciting possibilities and implications. So the men just couldn’t leave it there. That Harvest Supper was not going to be a one-off. Regular meetings began to be arranged, because of their excellent soup they were named The Soupermen, and there have followed over the years a series of food-based events - banquets, Easter and Christmas dinners, barbecues, film nights (with food! 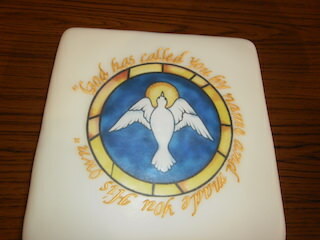 ), Alpha course, Lent lunches, etc. And all their proceeds go to local charities. The Soupermen have grown in numbers and have become an integral part of our church life, with their own strong visionary leaders and social life. Their annual outing this year was to Ireland (almost adding even more complications to the Brexit negotiations!). And they have provided not just wonderful dinners and events but have encouraged and enabled our large congregation to get to know each other and to develop our fellowship and outreach, to such an extent that, for example, the recent Easter Dinner felt like a happy family gathering, and our guests could see that Church is extremely enjoyable! 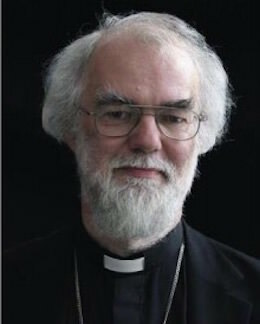 In 2010 our guest preacher at St Mary’s 800th Anniversary Service was the then Archbishop of Canterbury, the Most Revd Rowan Williams. The Soupermen provided refreshments on the church lawn, and that day Archbishop Rowan became an Honorary Souperman! – marking the high-point of his career! As we celebrate the Soupermen’s 10th anniversary this year, Archbishop Rowan is coming back to celebrate and preach again - this time for the anniversary not of St Mary’s but of the Soupermen. All are most welcome to join us for this Sung Eucharist in St Mary’s at 10 a.m. on 26th August. This service is to be a gathering of all the churches in the Caldey Ministry Area, so St Mary’s looks forward to welcoming that morning the churches of New Hedges, Gumfreston, Penally, St Julian’s, St Florence, and St James’ Manorbier. 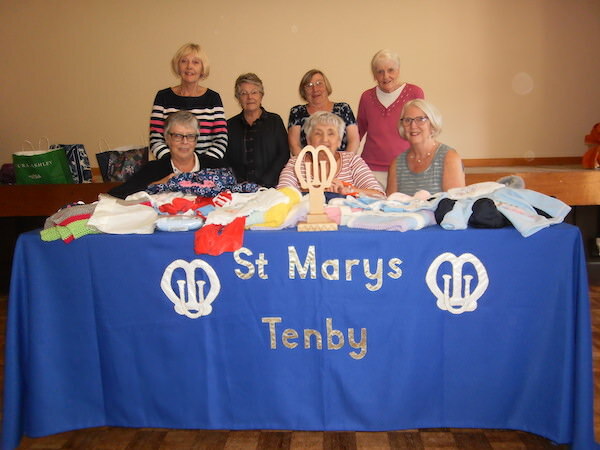 Each year the Parochial Church Council of St. Mary’s Church, Tenby, supports a variety of charities, local, national and international. As a Christian community we also continue to remain committed to maintain and enhance the beautiful church buildings within our care. 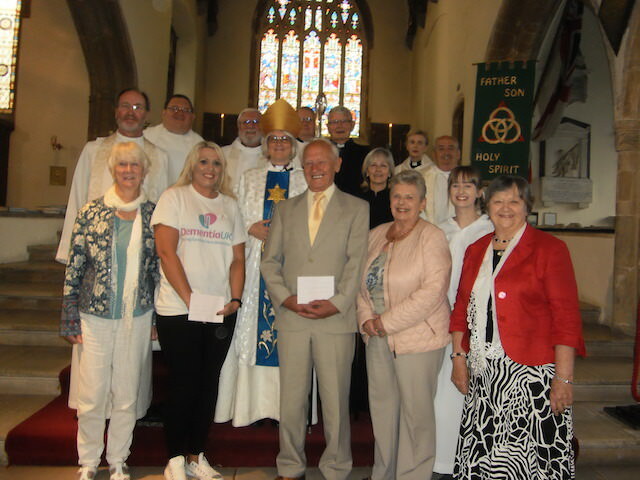 On Sunday, 27th May, Trinity Sunday, representatives of some of these charities joined the Eucharist congregation and were presented with generous cheques by the Rector, Canon Andrew Grace. The administration of the charitable giving project requires considerable effort and dedication and, with the support of treasurer, David Morgan, this is undertaken each year by Rector’s Warden, Nicole Evans. Some of the charities in receipt of donations this year, representatives of which are pictured with Rector Andrew are : Tenby Scout and Guide Hall, Friends of the Community, Paul Sartori Foundation, Crohn’s and Colitis UK, The Salvation Army, Unique – a charity dealing with rare chromosome disorders, Pembrokeshire Voluntary Transport, H.O.P.E. 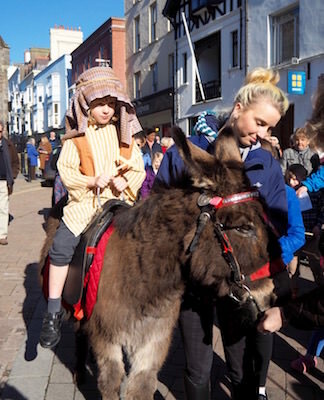 Sea Cadets, Air Cadets, Welsh Air Ambulance, Huntington’s Disease Association and The Donkey Sanctuary. Funds are being presented at a later date to several other very worthy causes, including Malaria No More, Pembrokeshire MIND, Alzheimer’s UK and Tenby Church in Wales Primary School. The church continues to support Christian Aid as well as caravan holidays for needy families. We feel that this is an essential part of our mission, and we are grateful that the revenue from the Rectory car-park enables us to help so many worthwhile causes. Donations from this year’s Memorial Posy Festival, in its 20 th year, being held between June 28 th and July 1 st , will be made to Diabetes UK and SNAP Cymru. Black Snow by Malcom Stacey - available now! Black Snow by Malcolm Stacey is a very unusual book. Though it’s a horror/ghost/crime blockbuster, it is very much about Tenby. St Mary’s Church is one of its main settings. Though the novel is chiefly in the present day, that fabulous story of the future Henry VII hiding out in Tenby cellars from the vengeful men-at-arms of the future Richard III is brought to life. There are also many facts and legends about Tenby and surrounding areas included in the thrilling plot. 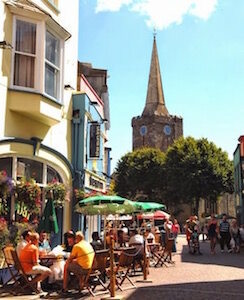 Making the novel really unusual is the inclusion of nearly 50 real-life Tenby people, most of whom are named. Though of course their thoughts and actions are purely fictitious. It’s an intelligent book with no graphic violence. But it is frightening. A great souvenir of Tenby, but don’t read it at night! 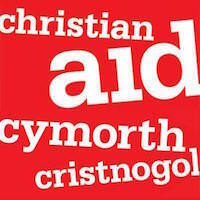 The established author is a member of this church and secretary of Tenby Christian Aid. Profits from sales in this church will go to that worthwhile charity. If you’d like a copy of Black Snow for £10, you should find the book on sale in St Mary’s. Or order through Amazon (in the normal way), where there is also a Kindle version at £1.99. 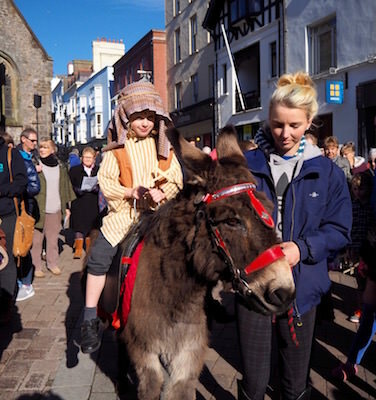 Here are some pictures from our Palm Sunday procession through Tenby, on Sunday 25th March 2018. We are very pleased to hear that Joel and Eleri have given birth to Tirzah, 6 lbs 6 oz, and very pleased too to hear that mother and daughter (and father!) are doing very well. Tirzah was born yesterday at about 5 p.m. Eliana has gone off with Daddy this morning to meet her new sister! As Tenby Benefice and Friends of St Mary's and friends in the wider Caldey Ministry Area, we congratulate and send our love and best wishes to Eleri, Joel, Eliana and Tirzah at this wonderful and beautiful time for them, and we look forward to seeing them all before too long. Lunch Out to Feed the World’s Hungry. There’s a chance for Tenby and surrounding villages to support starving children and their parents on every Wednesday during Lent - and have a delicious snack as well. 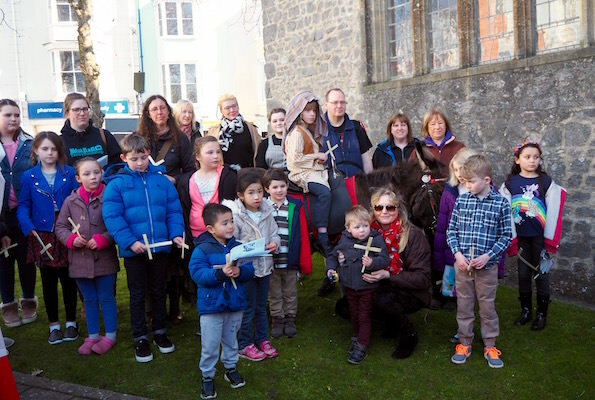 A trio of Tenby churches - St John’s, the Salvation Army and St Mary’s - are holding their annual Lent lunches in the six week run up to Easter. The lunch is a frugal one to highlight Lent’s traditional themes of preparation for Easter and denial. On offer is home-made soup, a roll and a cuppa. The suggested price is £5. But if you can give more, it will go directly to help starving families everywhere. Malcolm Stacey, Tenby secretary of Christian Aid, said ‘Our lunches have the twin benefits of dining with old friends and new, while helping all those who are struggling just to live. The first lunch, beginning at noon until 2pm, is in Church House at St Mary's on Wednesday February 21, The second and third lunches are at the Salvation Army Hall on Wednesday February 28th and March 7th. The fourth and fifth lunches are at St John’s Church Hall on March 14th and 21st. And the final lent meal is at St Mary’s Church House on March 28th. Anyone who hasn’t time to eat, is invited to leave money at the door. Or with the Christian Aid secretary at 9 Crackwell Street. Tenby. Joshua Geertman, Curate Joel Barder, Melanie Paassen and Ellie Pearson. “God has called you by name and made you His own”. These inspirational words express the meaning, truth and significance of Sunday’s Confirmation celebration at the first Sunday of Advent benefice service at St. Mary’s Church. 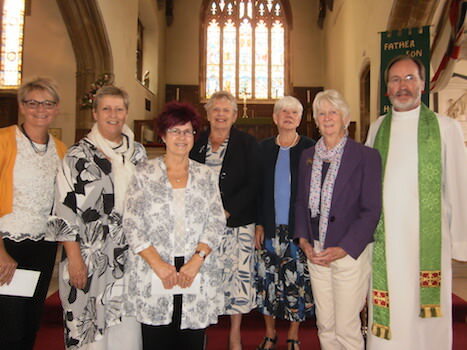 Five candidates were in attendance to receive confirmation of their decision to formally enter membership of the church and were presented to The Bishop of St. Davids, The Right Reverend Joanna Penberthy during the Holy Eucharist. The candidates this year were William Cahill, Ellie Davies, Joshua Geertman, Melanie Paassen and Ellie Pearson. The young people were prepared for Confirmation by our Sunday Club leader, Nan Dowell, assisted by Curate Joel Barder. 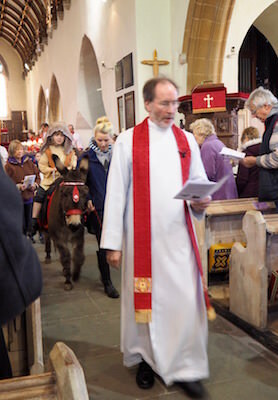 This was a truly joyous and uplifting event for Advent Sunday, at which time we prepare for the wonders of the birth of Jesus, a king born in a humble stable over two thousand years ago. Bishop Joanna spoke with great enthusiasm about the significance of Confirmation, it being the beginning of adult life within the church. She explained to us all, and particularly the candidates, about the meaning and relevance of God’s Holy Spirit being freely given to us all in our individual lives. Children all over Pembrokeshire and, of course, all over the world, are already anticipating 25th December with growing excitement, with the prospect of the gifts they hope to receive. 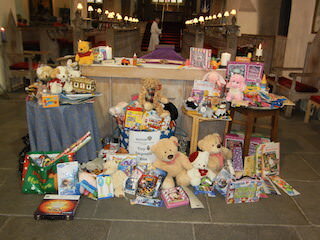 The enormous generosity of our community was again demonstrated on Sunday, when a mountain of beautiful gifts for children were on display in church. PATCH is a local charity, supporting families throughout the county who are suffering hardship and deprivation in its many forms. Its annual Toy Appeal was launched at the end of October and it was decided that this truly worthy cause would again be supported by the benefice. PATCH representatives, Tracy and Jan, attended the service on Sunday to receive the gifts and expressed their delight and amazement at the quantity of toys which had been donated. The music for the service was arranged by Dr. John Harrison and Mark Thompson, with the organist being Clive Raymond in Dr. John’s forced absence, due to illness. We all send our good wishes to him, with prayers for a speedy recovery and return to St. Mary’s. The entire service was enhanced by the splendid renditions offered by the choir, particularly the motet, Come Down, O Love Divine. Following the service special celebratory cakes were served to the candidates, their friends and families and benefice members, bringing to a close a most enjoyable and important occasion. At a recent meeting of St. Mary’s Mothers’ Union Samantha Duggan, the area representative of Plant Dewi, was warmly welcomed by all of our members. Sam is the brains behind the excellent Baby Bundle scheme, a project to support vulnerable families within the diocese of St. Davids. After a first class presentation concerning the work of Plant Dewi, Samantha was delighted to accept the tremendous quantity of clothes and equipment which had been collected in order to support this essential scheme. Our leader, Ellen, along with the committee members, would like to sincerely thank members of MU, parishioners at St. Mary’s and friends in the wider community for their generosity and kindness shown in providing so many items for new babies whose families need a helping hand at a very expensive time. Samantha Duggan is seen at the centre of the group of MU members, displaying some of the beautiful clothing donated. Sunday 3rd September a special day at St Mary`s Church Tenby. 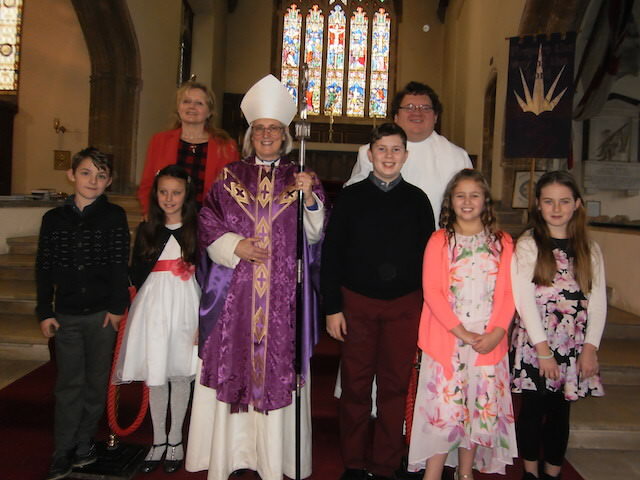 The first visit of Bishop Joanna, Bishop of St Davids many visitors joined our church family for our Patronal festival and to celebrate the work of The Friends of St Mary`s. During the service representatives of Dementia UK and Tenby Talking books accepted cheques for £1800 each towards the wonderful work they do. This money was from donations given during our Posy Festival held earlier in the summer. Here are some photographs to celebrate Joel Barder's ordination at the Cathedral, and his first Holy Eucharist in St Mary's Church on 25th June 2017. We all wish you many congratulations Joel!